Following the SFO aNCL, an update to the earlier San Francisco map was needed. The slight redesign of the map islands with changed key and added graphs of temporal elements. The exclusive islandification of the area is enforce with a new frame. This provides more visual stability, allowing for stronger vertical orientation. Regarding the temporal elements, San Francisco is an evening city. The lefthand rose shows the twitter activity over the days of the week, starting with Sunday at the top, going clockwise. The rose on the right shows the tweet activity per hour of the day, starting at 00:00 at the top. Here we are showing local time in San Francisco. Hence the characteristic dip between three and five o’clock in the morning. San Francisco is a typical evening city with more activity in the late hours of the day. There is a lot more activity in the later hours of the day than there is in the mornings. Comparing to Bogotá for example, a morning city, SFO has this lag with a first peak around noon and then high activity between 20h00 and 23h00. After that it drops off quite quickly, being considerably lower around midnight reaching the base around 3 am. 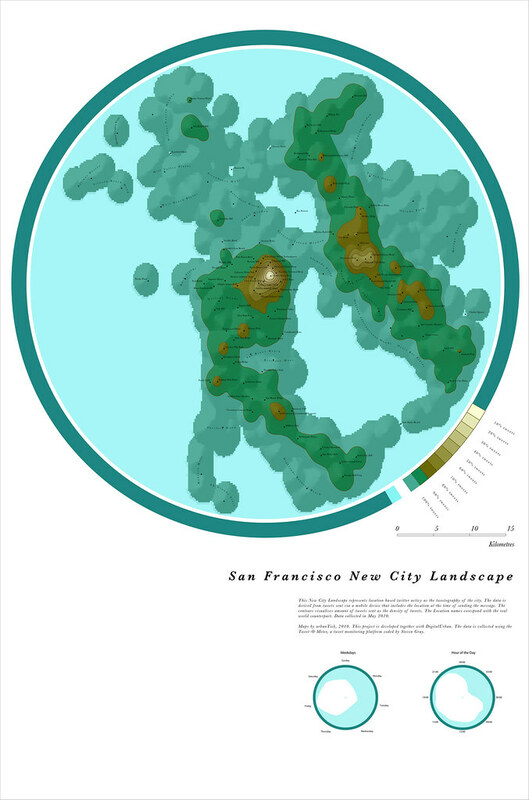 Image by urbanTick using the GMap Image Cutter / San Francisco New City Landscape – Use the Google Maps style zoom function in the top right corner to zoom into the map and explore it in detail. Explore areas you know close up and find new locations you have never heard of. Click HERE for a full screen view. The maps were created using our CASA Tweet-O-Meter, in association with DigitalUrban and coded by Steven Gray, this New City Landscape represents location based twitter activity.